INTENSE DRIVING - Hit speeds of up to 700 km/h while driving on floors, walls and ceilings - anything you can get your tyres on to keep the hammer down. And these brutes just want to keep on going, with GRIP's specialised vehicle design and physics, flipping the car over no longer means game over. EXOTIC PLANETS - Race on a variety of planets. From hostile. icy worlds to foreign, non-terrestrial cities. 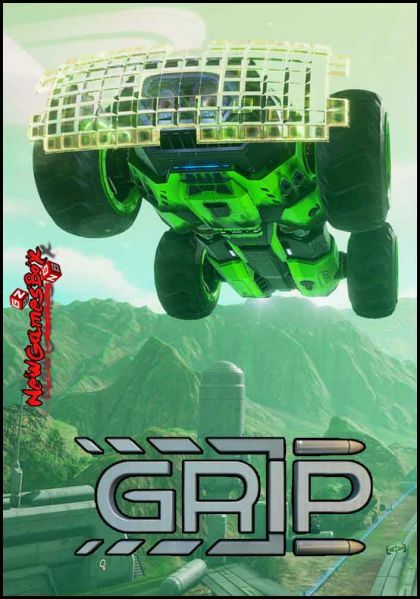 GRIP's locations will be different from anything you've raced through before. With destructible structures around each track to use against your opponents, along with a variety of possible routes, you have to use your wits as well as your skill to win. BADASS RIDES - Choose from a roster of armoured cars, manufactured by different companies from around the galaxy. Each car has different specs - some swift and agile, others brutish and heavily armed. Then go on to customize your ride's appearance and performance with hard-earned upgrades. AWESOME PICK-UPS - Use an array of power-ups and weapons, ranging from missiles and guns, to layable traps and plasma cannons. We want to create the most bombastic weapons ever seen in a game like this, and we welcome input from the community. You help us design them, and we'll bring them to life. KILLER TUNES - Race to a variety of bangin' electronic music, ranging from techno, to trance to our main jam, drum n bass.